Prince Phillip's regal presence and impeccable conformation are due to his impressive and exclusive lineage. His sire, Predictor, (100% Allianza, out of Hemingway), is no longer available for outside breedings. His maternal grandsire is PPPeruvian El Moustachio who is 100% Accoyo. This exclusive lineage gives him the best of both worlds. Not only has he racked up an impressive pile of ribbons and 1 color champion, but Prince Phillip's fleece is incredible...4 fleece champions! "Wow"! is the typical comment from visitors to the farm. Prince Phillip is passing along his superior qualities to his 69 progeny who have now racked up over 30 Championships, 2 Judges Choice, 2 Best Crimp and over 70 Blue Ribbons. ELK Valencia is one shining example of what Prince Phillip produces. Valencia is a 13x Champion with 23 Blue Ribbons and the 2010 MAPACA Judges Choice which is a phenomenal feat! ELK Melody another shining example was hand selected by Barbara for the 2006 Breeder's Edge auction as their top consignment. Melody turned out to be the top seller at the auction selling for $59,000 as a juvenile. Melody has now racked up 3 Color Championships and 5 Blue Ribbons, including a Fleece Championship at 2007 AFCNA under Tim Lavan. 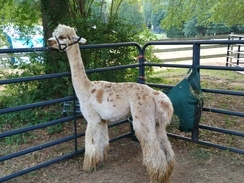 Prince Phillip's offspring dominated the 2009 Maryland Alpaca Show & Sale taking 3 Color Championships and 1 Reserve. His daughter ZU Tangeray took another Color Championship at PAOBA Breeders Showcase and then top it off with the Judges Choice. From the breeding program at Double O, Sirin has such notables as PPPERUVIAN AUGUSTO, PPPERUVIAN MR. PRESIDENT, PERUVIAN MUCHO GUSTO, and PERUVIAN CENTENO in her background. For those who like appaloosas, she is capable of producing a spotted offspring as evidenced by ELK Prince of Luck sired by HDF Prince Phillip. 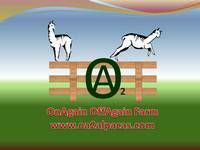 She has been bred to MRN MATRIX LORD OF SIPAN for a Fall 2018 cria. Gorgeous head, wonderful disposition, spots galore, show record and outstanding genetics. Who could ask for more? His pedigree includes such greats as HDF Prince Phillip, PPPeruvian El Mustachio, Hemingway, Augusto, and PPPeruvian Mr President.